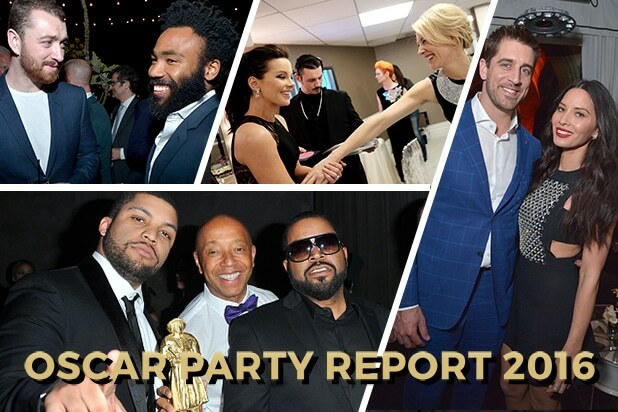 Sam Smith's drop in on "Spotlight's" dinner party, Russell Simmons' "All Def Movie Awards", Sunset Tower soirees, Stevie Wonder honors, and a slew of Vanity Fair warm up events topped the pre-Oscar party circuit. Over 400 friends of Michael Sugar, Steve Golin, and Doug Wald came to celebrate Anonymous Content and their nominees on Saturday night at the Sunset Tower. Their two Best Picture nominees as producers ("Spotlight" and "The Revenant") could continue the celebration in to Monday. 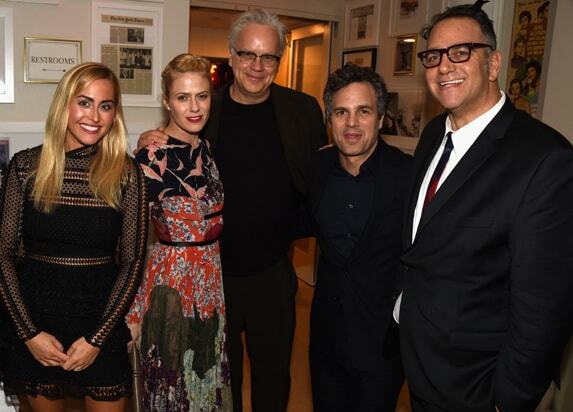 Lauren Sugar, Sunrise Coigney, Tim Robbins, Mark Ruffalo, and host Michael Sugar huddled early in the night. 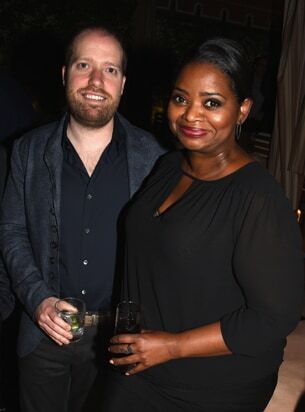 Octavia Spencer on the Oscars weekend scene. Jessica Szohr, Nina Dobrev, and Jessica Stam inside the Sunset Tower soiree. They had covered the pool and taken over the terrace for cocktails and dancing with DJ Spider. Guests were greeted with a sweet selection of sips from Grey Goose's Film Awards Season Cocktails Collection, like Le Reve, L'Amour, and Le Fizz. Olivia Wilde and Pilou Asbaek hung at Anonymous Content early, before Chace Crawford, Geoff Stults, and Ashley Madekwe would come through after midnight. As Brie Larson exited the Spirits stage with a win, young Jacob Tremblay was there to greet her at stage right. Katie Holmes slipped in to the backstage area of the Spirit Awards on Saturday, sharing a "spoonful of support" for indie film at the Breyers Gelato Lounge. It was one of a few more exclusive enclaves backstage that required enhanced credentialing beyond the blue wristbands everyone had on at the Spirits. Before "Spotlight" went on to win 5 Spirit Awards, director Tom McCarthy grabbed a Heineken pre-show with star Rachel McAdams. Rami Malek and Freida Pinto on the Spirits' blue carpet. Party time for these John Cassettes Award winners. Team "Krisha" Director Trey Edward Shults (left) gave a heartfelt acceptance speech about working with his mom and unfamous aunt to get the film made. Meanwhile, UCLA's School of Theatre, Film and Television brought 2016 Oscar nominated Costume Designers together for their annual "Sketch to Screen" panel. From left: Moderator Deborah Landis, Jenny Beavan ("Mad Max: Fury Road"), Paco Delgado ("The Danish Girl"), Suttirat Anne Larlarb ("Steve Jobs"), Sandy Powell ("Carol" and "Cinderella"), Jacqueline West ("The Revenant"), and 2014 nominee Michael Wilkinson, who did "Joy" this year. Backstage at the costume awards at the Beverly Hilton, Cate Blanchett tagged Kate Beckinsale. The hunk of glass in the "Best Actress" nominee's hand is her LACOSTE Spotlight Award in the shape of the iconic shirt's alligator. "To this soirée I invite all the African American women and women of color who have ever been nominated for an acting Oscar and those, who in perfect world, should have been," Alfre Woodard said of her guestlist for her annual "Oscar's Sistahs Soiree". The 2016 class of attendees:Margaret Avery, Loretta Devine, Lorraine Toussaint, Marianne Jean-Baptiste, Aisha Tyler, LaTanya Richardson, Aja Naomi King, Anika Noni Rose, Jurnee Smollett-Bell, Alfre Woodard, Emayatzy Corinealdi, Rosario Dawson, and Yolonda Ross all hit up the Tanqueray No. TEN hosted party at the London in West Hollywood. The imposing Finnoula Flanagan has a word with countryman Colin Farrell at Laurel Hardware on Wednesday, the scene of the Irish Film Board/IDA's first Oscar week event. Lure nightclub in Hollywood was the scene of Russell Simmons' "All Def Movie Awards" taping on Wednesday night. The "Cube" family (O'Shea Jackson Jr. and papa Ice Cub (3rd from left)) flank the creator. At right, "Straight Outta Compton" associate producer Darrell Jackson. ...who is still directing. Rachel McAdams listens attentively. Liev Schreiber and favorited screenwriter nominee Josh Singer in the Bungalow. Irene Neuwirth and Busy Phillips poolside. Same stylist? Smith and VF Publisher Chris Mitchell. Charlie Puth's smash song "See You Again" from "Furious 7" missed out on an Oscar nomination after netting Grammy and Golden Globe consideration. Puth performed at Global Green's enhanced Pre-Oscar party at Mr. C on Wednesday night. Hollywood couple Courtney Love and director Nicholas Jarecki have made appearances on the awards season circuit this year, most recently at Global Green. After several ho-hum years at the Avalon with dress presentations, Global Green up-shifted to Mr. C in Beverly Hills with Stevie Wonder. The "Superstition" singer had nothing to worry about, already designated to receive the "Hero" award from the environmental org that announced alliances with the United Nations and World Bank. Irish cinema had more to toast than just "Room" director Lenny Abrahamson, though he is a headliner this season. "Brooklyn" has figured in to the awards race and part of "Star Wars: Episode VIII" have already begun shooting on the isle. Irish ambassador Anne Anderson joined the celebration on Wednesday. The Oscar telecast orchestra rehearsing 96 hours before the live show. 25 people photographing 3 guys rolling out the Oscars red carpet on Hollywood Blvd on Wednesday. J. Alexander and Jason Ritter on the gifting suite scene, where they met over "Essentia Ionized Alkaline Water" at Kari Feinstein's. The night before, Vanity Fair's Krista Smith (left) and Olivia Munn (right) hosted the first of a week of Vanity Fair events. Mann's QB boyfriend Aaron Rodgers (center) is no stranger to Hollywood in the off season. The two had a nearly impenetrable friend-huddle, with security cordoning off their center area in the garden creating the rare VIP area within the Chateau. "For me it starts in August when I'm prepping for Toronto," Smith said of the week long series of panels and parties that dovetails with the recent Hollywood Issue. With "The Hateful Eight" up for three Oscars on Sunday, Quentin Tarantino made an early trip to the podium for the CDGA's "Distinguished Collaborator Award." Blanchett gives Andy Garcia a warm greeting, but it might be Sandy Powell (right) who needed it. Powell is a double Oscar nominee for "Carol" and "Cinderella" but lost to her peers from "The Danish Girl" and "Mad Max" in both of her CDGA categories on Tuesday night. Both of those victors are Powell's co-nominees in the Oscar Costume Design category. Kiernan Shipka and Constance Zimmer at the 18th CDGA's. This is B. Akerlund on the left, who was nominated for a Katy Perry H&M commercial. You know music video director Jonas Akerlund (right) for his work going back to the '90s with Madonna, Lady Gaga, Metallica, and the recent Taylor Swift 1989 World Tour Live. Over at the Chateau, Louise Roe (who will be participating in one of the "Campaign Hollywood" panels at VF's Social Club) buddied up with power couple Chris Hardwick and Lydia Hearst. This group put the young in "Young Hollywood" at the Fiat-hosted bash: Laurent Gaudette, Ariel Winter, Nolan Gould, and Keke Palmer. Stephen Merchant and Carly Craig at the Chateau. Kudos to Jonathan Leibson for capturing the fashion scene's preferred music maestro Mia Moretti plying her trade, without plying the model-pout that Moretti is known to flash when flashbulbs are near. "American Horror Story: Hotel" winner Lou Eyrich and the CDGA's Exec Producer JL Pomeroy.